CHARLES CITY — Robert “Bob” Hammel, 84, of Charles City, passed away Saturday, May 6, 2017, at the Floyd County Medical Center in Charles City. A private family graveside service for Bob Hammel will be held at Sunnyside Memory Gardens in rural Charles City with Pastor Rod Rindahl (Bob’s neighbor and friend) from New Life Community Church officiating. Visitation will be at Hauser Funeral Home from 5:00 to 7:00 p.m. Wednesday, May 10, 2017. Family and friends are invited to the VFW in Charles City at 12:30 p.m. Thursday, May 11, 2017 for a continued celebration of Bob’s life. 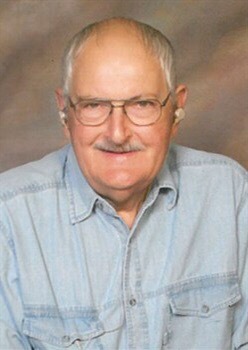 Robert “Bob” Alan Hammel, the son of August and Vera (Wirth) Hammel, was born September 28, 1932 in Butler County, Iowa. He attended country school in Butler County before entering the Charles City School System graduating from Charles City High School in 1952. While in high school, he was a member of the FFA which he was very proud of even in his later years. Bob was united in marriage to Mary Lokenvitz on June 1, 1958 and this union was blessed with three children. He farmed with his father and by himself until 1980 and was employed at the Sherman Nursery in Charles City for 24 years. Bob took great pride in being able to grow just about anything with great success. He will always be remembered as a quiet man who didn’t know a stranger. His family will miss his great big bear hugs and his sharing of pictures he took of his flowers. Bob enjoyed number search books, refinishing wood furniture, watching sports on television, taking photographs, antique shopping (especially while visiting family in Colorado) and watching America’s Got Talent. He loved spending time with his family and supported his children and grandchildren in their activities whenever he was able. Bob was very proud that all of his grandchildren received a college education. Living family members include his three children: Deb TenBrink of Denver, Colorado, Michael (Nell) Hammel of Sergeant Bluff and Diane (Mike) Bucknell of Ionia; six grandchildren: Cassie Foust, Anna (Dusty) Johnson, Michael Hammel, Ellen Hammel, Jayme Bucknell and Conor Bucknell; two great-grandchildren: Caiden Johnson and Briella Johnson; special niece, Lori Gregg of Charles City; two sisters-in-law: Dixie Gettings of Denver, Colorado and Judy Lokenvitz of Muscatine; brother-in-law, Jerry (Marge) Lokenvitz of Sun Prairie, Wisconsin; his beloved pet cat, Oliver; along with other nieces, nephews, family members and a host of friends. He was preceded in death by his parents; his wife, Mary in 1983; sister, June Lokenvitz; brother, Dean Hammel; and two of his previous pet cats: Klondike and Smudge. In lieu of flowers the family suggests memorial contributions be made to Iowa Hands and Voices, P.O. Box 1065, Johnston, Iowa 50131.